Da es immer wieder Probleme mit dem Download auf der Projektseite von Instructables gibt, habe ich die PDF Datei auch hier mal hinterlegt. Wer den Hirsch nicht schneiden, falten und kleben will, kann ihn auch mit einem 3D-Drucker ausdrucken. Die STL Daten habe ich bei Pinshape hochgeladen. 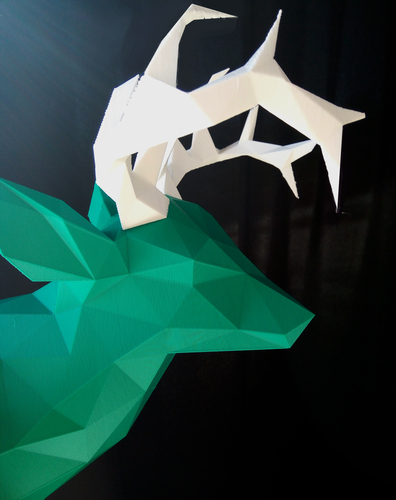 After numerous requests on my instructable project page, I have uploaded the PDF for the faceted deer here. If you don’t feel like cutting, folding and glueing the head, you can 3D-print it also. the required STL files are on Pinshape. I want to build this but I had a question. What is the difference between the point lines an the “line-point” lines? Nochmal auf deutsch: welcher ist der unterschied zwischen den gestrichelten Linien und die “gepunktete” Linien? Muss man beide falten? how big does it end up when made in A3 paper? Big, take a look at the screenshots on Instructable. Somewhere on the bottom are the calculated dimensions. gibts die Datei zufällig auch als .PDO Datei? Wäre gut um zu sehen, welches Teil wo hingehört. I made your deer head a while ago and it looks very good on my wall! While looking at Etsy I came across your model at the shop Verticees. Don’t you think it is wrong that it is sold there for profit? Well, someone took the tutorial and made one themselves and sells it now. There’s nothing wrong with that other than that is doesn’t show a lot of creativity. I TRIED IT, AND IT TURNED OUT GREAT!!! I have made it and finished it with leather! He is awesome!! If you send me your email adress I will send you a picture! l think your idea is very good,thankyou for your pdf. I’m so happy you have the pattern posted here. I’m going to try to make it. Hi Jan, awesome paper deer you made – thanks a million for sharing, will definitely squeeze in a weekend for this magic sculpture! Quick question from my side: if I wanted to build the same one as blue & white paper deer, which pages would need to be printed in blue and which pages would need to be printed in white? Thanks a lot for your help and have a nice weekend! Please take a look at the Instructable, it is mentioned there somewhere. I think the last four but better check. Hey, ab welcher PDF Seite muss ich auf ein anderstfarbiges Papier drucken, damit dass Geweih eine andere Farbe hat? Ich glaube die letzten vier, aber besser noch mal auf Instrucatbles nachschauen. Hab’s nicht mehr im Kopf. you are amazing. thank you so so so much. thanks for the pdf! Could you please tell me which are the antlers so that I could print them in different colour? I can´t say it from uncut paper. hoi,wauw, maar kunt u ook aan een free oliefantenkop komen om te downloaden. mij lukt het niet, van uit instructables. The Elefant is not my design, sorry that’s why I can’t share it. Have you created these? Are you okey that someone sells theese on ebay? FYI, there is someone in Sweden that sells these on our ebay (tradera.se) for 150 SEK (15 EUR) each. The license does not permit anyone to sell my template. If they have done their own template they can sell it of course. I do not have the time to track down everyone that offers my template. People have done so on every continent by now. On which pages are the horns? Hey we were planning to use your deer head template for a 3D illusion for an intra-school design competition. Are we allowed to use your template for it? ?